Parking: Parking is available behind the property in a small carpark please note if parking on the road next to the property we ask you not to park in front of the small window downstairs facing the sea, as our kind neighbour likes to look out of the window. The holiday apartment occupies the upper two floors of a three-storey B-listed building. The apartment is comfortably furnished and benefits from stunning views across the Firth of Forth. The rooms have been decorated in keeping with the style of the building, retaining period features, such as the window shutters. There are all the modern facilities you’d expect. 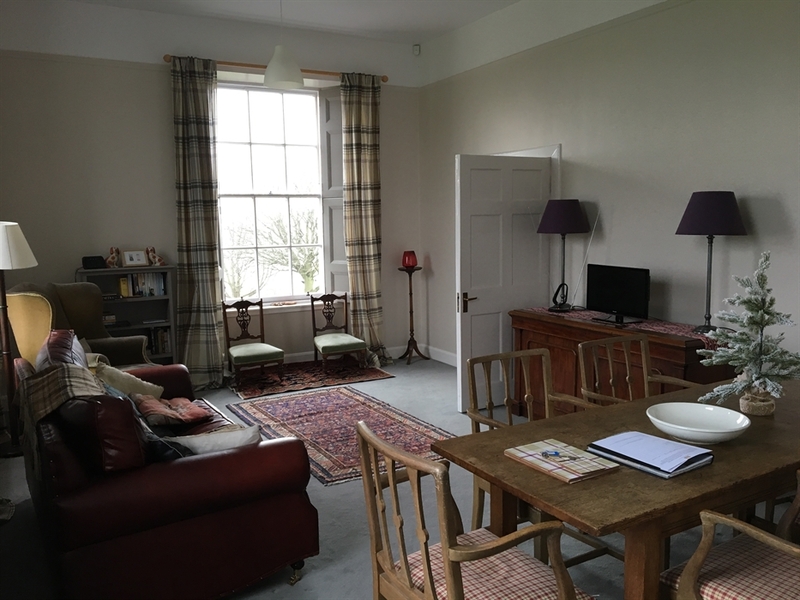 John McDouall Stuart View is an ideal stopping-off point if you are en-route to the Highlands, looking for close links to Fife’s world-famous golf courses, or walking the Fife Coastal Path. Kirkcaldy Train station is a 10 minute drive away and can take you into Edinburgh or further up North. There are several bus stops that travel across Fife, within a 5 minutes’ walk from the holiday apartment. Works to convert explorer John McDouall Stuart’s house in Dysart to a holiday apartment were completed in May 2013. If you’re looking for a coastal bolt-hole with lots of history and character, John McDouall Stuart View is for you! Here you can relax and gaze out on the same seas that inspired the explorer John McDouall Stuart’s desire to travel. John McDouall Stuart was born in this house in 1815 and later emigrated ‘down under’ where he led the first expedition to cross Australia from south to north in 1862. He is a celebrated figure in Australia, where he has a 950-mile highway named after him. As well as its picturesque harbour, Dysart boasts the historic St Serf’s Tower, rows of attractive whitewashed and red pantiled cottages at Pan Ha’ and the refurbished Harbour Master’s House with its visitor centre and café. The long distance Fife Coastal Path goes through Dysart and visitors can also follow a town trail, accompanied by audio guide. Series 2 of the popular TV drama, ‘Outlander’ was filmed in Dysart. Ravenscraig Castle is within walking distance and provides some beautiful views across the Firth and Forth. Within the town of Dysart there is a corner shop, chemist, post office and café. Dysart is just off the large town of Kirkcaldy where there are many restaurants, bars, cafes, clothing shops as well as large supermarkets. The train station in Kirkcaldy operates the Fife Circle which travels to Edinburgh, as well as Perth, Dundee, Inverness, Aberdeen and Glasgow There is a bus stop 5 minutes away which supplies the no7 Leven-Dunfermline Route, Kirkcaldy is a main bus stations serving routes across the country and beyond. Trips into Edinburgh City centre are quick and easy, the train will take you to Edinburgh Haymarket or Edinburgh Waverly where there is an endless array of culture, history, restaurants, bars and shops. For more information please contact Beth at info@fifehistoricbuildings.org.uk or book today.